Please click on the title to view the article. The following files are electronic PDF reprints of articles appearing in our magazines. 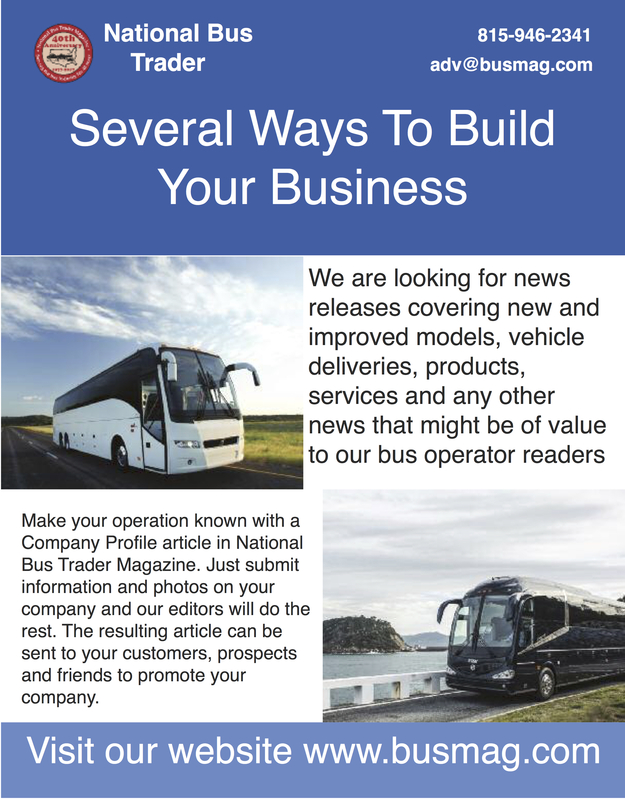 National Bus Trader, Inc. grants limited rights to download, print, and distribute any articles posted here, with the understanding that articles will not be altered or edited in any way. Article reprints must be kept as posted and may not be sold commercially. By downloading an article from this page you indicate that you agree to follow the terms and conditions listed above. Temsa recently announced that they are moving to a company-owned distributor for the American market. This is a substantial show of confidence in the American market as well as the Temsa products. Creating a new distributor for national support is a major undertaking and somewhat unique. In 2018, Angel Tours and Entertainment Inc. is in the midst of celebrating its 20th anniversary as one of Canada’s most prominent charter companies. It continues to live up to the company’s name – being an “angel” of great service to the thousands of passengers it carries each year. Founded in 1933 and named for the boy in Neverland who did not want to grow up, Peter Pan Bus Lines has indeed grown up to become a major and highly respected bus operation in the Northeast States. This is the history and story of the company from Springfield, Massachusetts that now operates routes and garages in several states and has become a major scheduled service operation and member of the bus industry. From the November, 2018 issue of National Bus Trader. Every two years, ZF has a special event for the press to show what they are doing and what they will display at the forthcoming IAA Show on Hanover. This 2018 event continued progress with major components but was noteworthy with ZF’s expansion into new technology including autonomous driving. From the November, 2018 issue of National Bus Trader. Now an annual event, MCI’s Reliability Rally event provides an opportunity to find out what is new at MCI and the New Flyer Group, meet with leading industry suppliers and visit with old friends in the industry. Here is our report on what happened at the 2018 events including the introduction of the new J3500. From the November, 2018 issue of National Bus Trader. ZF has developed a wide range of components that allow bus manufacturers to offer electric and battery electric buses. 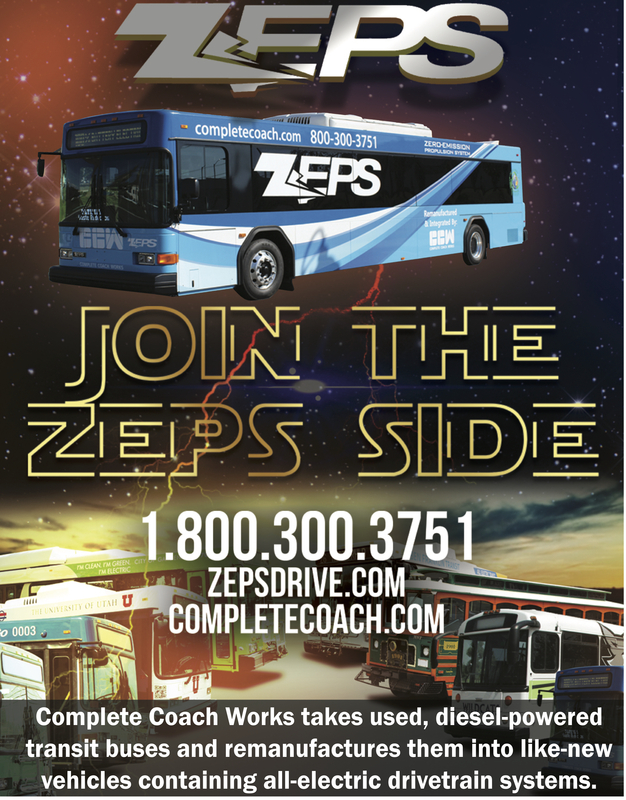 This article covers past, present and forthcoming electric bus components and systems from ZF. From the August 2018 issue of National Bus Trader. Training the next generation of bus mechanics and technicians is increasingly difficult as we move from wrenches to laptops. The MCI Academy has the answer with both hands-on training as well as on line sessions. From the June 2018 issue of National Bus Trader. Buses have been used in many election campaigns of the years. This one is a little unusual in that it was used in a nation of islands and is substantially different than campaign buses used in the United States. From the June 2018 issue of National Bus Trader. Regarded by many as the most important bus show in the world, this report covers the 24th biannual event that included 376 exhibitors and hosted more than 37,000 attendees. It was held in Kortrijk, Belgium in mid-October of 2017 but will move to Brussels in 2019 because of a need for more space. Our report highlights exhibitors of interest to the U.S. and Canadian bus operators. From the February 2018 issue of National Bus Trader. 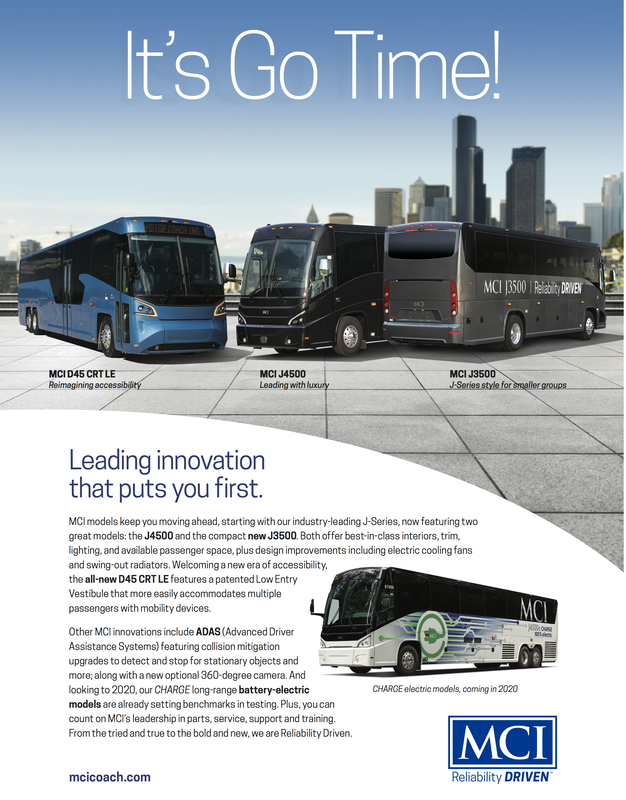 This report provides information and details on MCI’s new commuter coach model. Based in the popular and reliable “D” series coaches, the D45 CRT LE offers a lower level to make it easier, simpler and quicker for passengers in mobility devices to enter and exit. From the March 2018 issue of National Bus Trader. These three columns by Ned Einstein, complete with illustrations, cover the new MCI D45 CRT LE Commuter Coach from a standpoint of its innovative design and capabilities. #1 – December 2017 – Introduction and striking innovations. #2 – February 2018 – Details of the vehicle and their significance. #3 – March 2018 – Bus design and more. Over the years, National Bus Trader has offered articles reviewing alternative fuel buses with emphasis on the movement to electric buses. This article shows that electric buses are coming of age and joining the mainstream. The article covers recent years of experience with electric buses in Europe, it mentions the companies offering remanufactured electric buses and ends with the emerging electric bus market in the United States and Canada. From the April 2018 issue of National Bus Trader. Bus seat belts have been mandated on new coaches but the lack of seat belts on older coaches has occasionally been the reason for litigation. Here is some basic information on the situation as well as information you can use in court if need be. From the August 2016 issue of National Bus Trader. 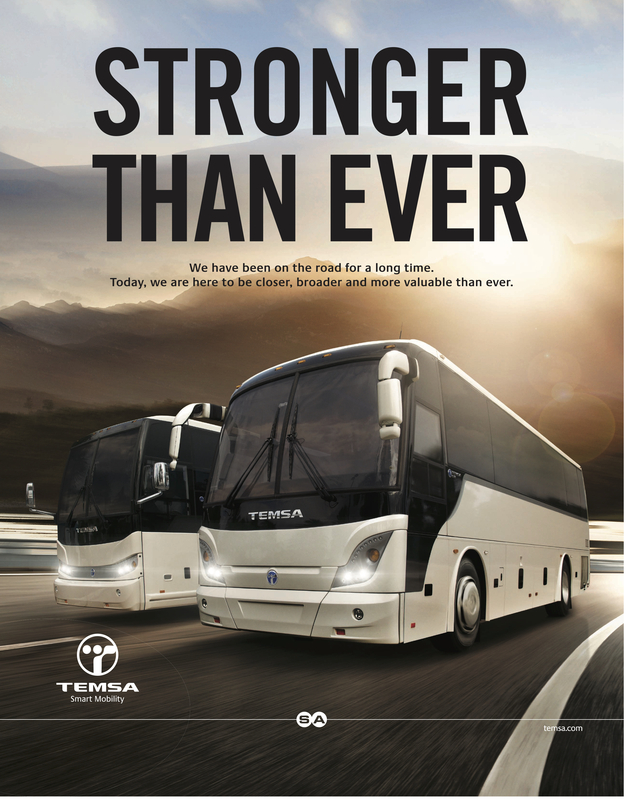 Entering 2016, CH Bus Sales and Temsa offer a round of improvements and developments for the American market. Included are increases parts and service, improved after sales and service, and the increasing popularity of their new 45-foot TS 45 model. From the January 2016 issue of National Bus Trader. Held every two years in Kortrijk, Belgium, Busworld Europe is considered to be the largest and most important bus show in the world. Here are some highlights from the October, 2015 show that are appropriate for American readers. From the February 2016 issue of National Bus Trader. Founded in February, 1936, the Trailways organization celebrates 80 years. Here is the story behind the founding of the organization and several of the highlights as well as the problems it faced during these 80 years. From the February 2016 issue of National Bus Trader. Based in Orland and having recently acquired Travel Lynx, Stylus Transportation has a history of providing specialized transportation for inbound visitors and now operates the largest Volvo fleet in Florida. From the August 2015 issue of National Bus Trader. Following suggestions from customers, MCI embarked on a program to improve its parts fulfillment and service. Here is a review of the various new MCI programs and improvements in the areas of parts and service. From the March 2015 issue of National Bus Trader. BCA Coaches Now Available from Matthews Buses Inc.
BCA Coaches are now available from Matthews Buses, Inc. With several locations from New York to Florida, Matthews Buses will be providing sales, parts support and training for BCA coaches. In addition to providing service at the various Matthews Buses facilities, the company also has a fleet of service trucks that can provide service at customer locations. From the February 2015 issue of National Bus Trader. After offering CAIO coaches on the American market for a while, Alliance Bus Group now offers two news models. Included are the 45-foot S3645 and the shorter 36-foot S3436. Both new models boast of integral stainless steel construction. They also offer several improvements over earlier models. From the February 2015 issue of National Bus Trader. Following several years in Chicago, BusCon moved to Indianapolis in September of 2014. Sponsored by Bobit Business Media, BusCon specializes in mid-size buses for both the private and public sectors. Here is a review of the buses on display at this 19th annual BusCon. From the November 2014 issue of National Bus Trader. A review of current regulations, retrofitting, safety and liability in regard to motor coach seat belts. From the August 2014 issue of National Bus Trader. We take a look at MCI’s Reliability Rally gatherings around the country that provided a chance to meet with suppliers and introduced new components including ZF axles and Bendix air disc brakes. From September 2014 issue of National Bus Trader. We take the opportunity to have a close look at the new MCI J4500 with ZF axles and Bendix air disc brakes. Then we get behind the wheel and take this newest MCI out for a test drive for a chance to see what the new ZF axles, Bendix brakes and Bendix Wingman system operates. From the October 2014 issue of National Bus Trader. We travel to Aachen, Germany to participate in a ZF Global Press Conference for transport journalists. Here we have a chance to learn about new ZF products and systems while test driving trucks and buses on a dedicated test track. From the October 2014 issue of National Bus Trader. Originally involved in trucking, the Adams family decided to move into the bus business. The result is Southern Coaches in Dothan, Alabama, one of the most respected bus operations in the southeast states. Today the company operates both MCI and Temsa coaches. From the June 2014 issue of National Bus Trader. Following the success of their 35-foot TS 35 and 30-foot TS 30, Temsa and CH Bus Sales introduces their 45-foot model TS 45 to round out their product line. Here is a first look and the story behind the new Temsa TS 45. From the January 2014 issue of National Bus Trader. Held every two years, Busworld in Kortrijk, Belgium is considered the largest bus show in the world with more than 300 exhibitors from 29 countries. Here is our review of some of the buses at the 2013 Busworld in Kortrijk. From the December 2013 issue of National Bus Trader. Your modern bus transmission can make a big difference in fuel economy because of several different mechanical factors and even software. 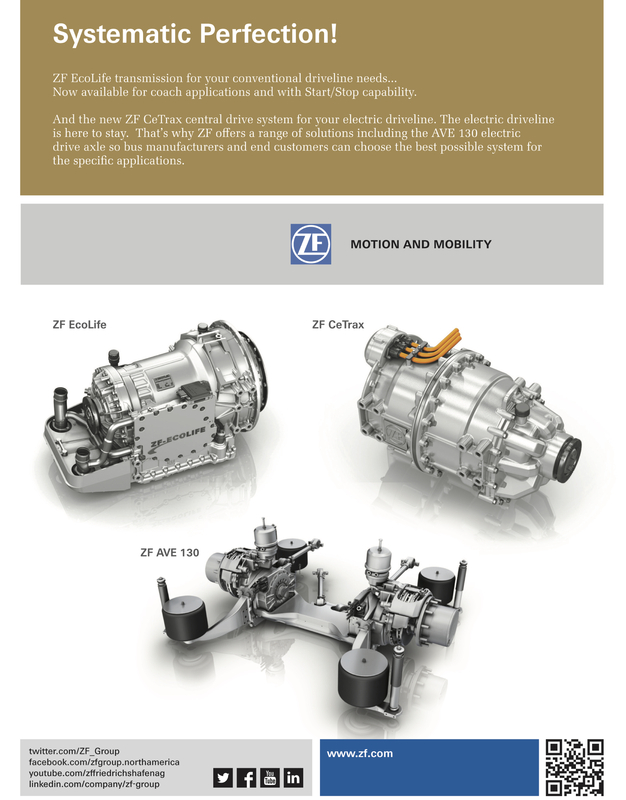 Here is some information from the people at ZF that explains the more important factors with transmissions that can impact fuel economy. From the November 2013 issue of National Bus Trader. Alliance Bus Group, with several locations in the eastern and southern states, offers a wide range of vehicles from vans through cutaways and mid-size buses to full size CAIO coaches. Offering strong customer service, their motto is “Along for the Whole Ride.” From the September 2013 issue of National Bus Trader. Originally founded as a private limousine service to a restaurant, AFC Transportation has grown to become one of the leading bus operators in Texas. Based in Houston, the company operates 170 vehicles including several mid-size Temsa coaches. From the September 2013 issue of National Bus Trader. Combining the best features of a van and a mini-bus, the Mauck2 offers the economy and durability of the Sprinter chassis combined with an attractive larger body. This article covers recent improvements on the Mauck2 as well as mentioning various interiors and options. From the September, 2013 issue of National Bus Trader. rom a repair shop in Winnipeg to the leader in coach sales in the United States and Canada, here is the story behind Motor Coach Industries. It includes the numerous things along that way that were responsible for the durability and longevity of their coaches as well as changes in ownership and production. From the June 2013 issue of National Bus Trader. We review the background of the CAIO coaches sold by the Alliance Bus Group and take a look at their factory in Brazil. From the May 2013 issue of National Bus Trader. From a single Buick sedan operating from Norfolk, Nebraska, Arrow Stage Lines has grown to multiple garages and an extensive coach fleet with 85 years of operating experience. From the May 2013 issue of National Bus Trader. Named for a storybook character living in Neverland, Peter Pan Bus Lines started out as a small bus operation with a roundabout route from Springfield to Boston, Massachusetts. Today it has become a dominant operation in the Northeast states and a very respected member of the bus industry. This article covers some of the highlights of the company over its 80 years of being “People Professionals.” From the April, 2013 National Bus Trader. The Transit Museum Society in Vancouver, B.C. has an interesting historical bus collection and even operates the buses on occasion. But they are currently having problems finding a place to store their buses. From the March, 2013 National Bus Trader. Escot Bus Lines celebrates its 30th anniversary in 2013. Originally founded in 1983 with two minibuses, Escot has grown through the years to become a major coach operators in Florida. This article comes from the February, 2013 issue of National Bus Trader. We look at the Alliance Bus Group and their CAIO bus product line that includes both mid-size and 45-foot coaches. From the February, 2013 issue of National Bus Trader. Saving fuel by reducing parasitic engine loads. Printed in the January, 2013 issue of National Bus Trader. Originally founded to transport workers to their jobs, Cavallo Bus Lines now operates out of Indianapolis, Indiana and Springfield, Missouri as well as corporate headquarters in Gillespie, Illinois. Printed in the December, 2012 issue of National Bus Trader. Celebrating eight years as the most popular coach on the U.S. and Canadian market, MCI gives the J4500 a facelift and new features for the 2013 model years. Printed in the November, 2012 issue of National Bus Trader. 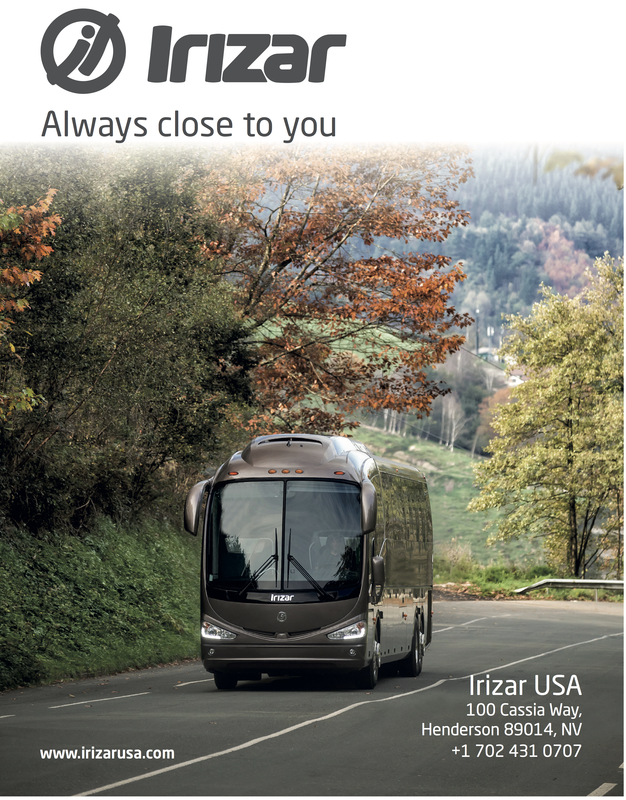 Covers numerous safety features provided in Setra coaches. Printed in the October, 2012 issue of National Bus Trader. The Second Time Around for First Rate Service – Loudonville, Ohio, once the home and headquarters for Flxible, is now a major center of activity for MCI. Here is a look at the various MCI operations at Loudonville ranging from collision repair, retrofitting, pre-owned coach repowers and even manufacturing parts. Printed in the September, 2012 issue of National Bus Trader. Thinking small may save you money. Details on the mid-size Temsa coaches with integral construction and big coach features being offered by CH Bus Sales. Also included is information on Temsa the coach builder. Printed in the August, 2012 issue of National Bus Trader. With the full ADA Guidelines taking effect in October of 2012, many operators are looking for ways to add coaches with wheelchair lifts to their fleet. MCI offers a wheelchair lift retrofit with OEM equipment and appearance. Printed in the July, 2012 issue of National Bus Trader. Founded in Belgium in 1947. 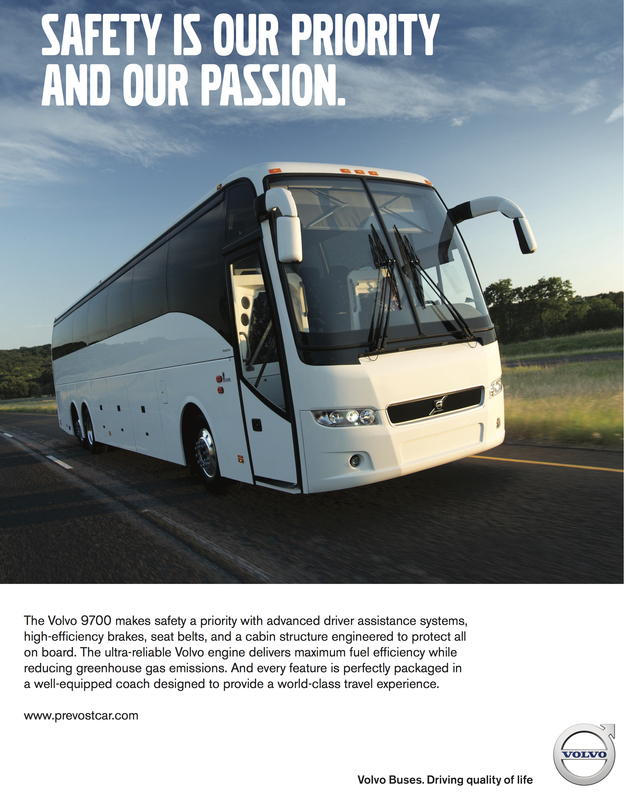 Van Hool celebrates 65 years as a quality coach builder in Europe and a major supplier to the U.S. and Canadian market. Printed in the May, 2012 issue of National Bus Trader. Founded in Old Town, Maine in 1912, John T. Cyr and Sons celebrates 100 years as a family business and one of the more respected bus companies in the industry. Printed in the May, 2012 issue of National Bus Trader. Review of the Bus World Europe show in Kortrijk, Belgium in October of 2011. Held every two years, this is reported to be the largest bus show in the world. Printed in the January, 2012 issue of National Bus Trader. Every three years the American Public Transportation Association holds their Expo show for suppliers to the public transit industry. It took place on October 3-5, 2011 at the Convention Center in New Orleans. Printed in the December, 2011 issue of National Bus Trader. A preliminary report on the early September, 2011 flooding at the George Sage Annex building and storage area of the Museum of Bus Transportation in Hershey, Pennsylvania. Printed in the November, 2011 National Bus Trader magazine. Founded in 1916 by Count Van Zeppelin to make gear drives for his airships, ZF has grown to a multi-billion dollar global manufacturer of transmissions, axles and other gear related components. Here is the story of their EcoLife transmission. Printed in the October, 2011 issue of National Bus Trader. Brilliant Transportation is turning heads with their fleet of Sprinter vans with luxury interiors used for both business and personal travel. Printed in the September, 2011 National Bus Trader magazine. Points to consider when you give a bus, collectables or any items of value to a group or charity. Printed in the June, 2011 National Bus Trader magazine. This is a current update of the more popular bus conventions, trade shows, gatherings and events held in the United States and Canada plus some outside of North America. Printed in the May, 2011 National Bus Trader magazine. MCI Commuter Coaches are in operation in many areas providing fast, comfortable transportation to and from suburban areas or as a replacement for commuter rail. This article from the March, 2011 issue of National Bus Trader provides information on current developments and options including the ongoing move to Going Green. Keeping up with customer needs, MCI is now offering an enhanced pre-owned coach program offering three levels of quality ranging from economical to high quality. Printed in the January, 2011 National Bus Trader magazine. The detailed story behind ABC Companies’ new Refurbishment program for pre-owned coaches. Printed in the January, 2011 National Bus Trader magazine. This unique small vehicle combines the durability and economy of the Sprinter with an attractive custom body suitable for applications ranging from a custom van to a small bus. Printed in the November, 2010 National Bus Trader magazine. The story behind Larry Yohe and his restored Continental Trailways Silver Eagle. Printed in the September, 2010 National Bus Trader magazine. Is Climate Change Still a “Hot” Topic for the Bus Industry? Provides information disproving Anthropogenic Global Warming, suggests that the earth has actually been cooling, and explains some of the Global Warming errors. Printed in the February, 2010 National Bus Trader magazine. This three-page article covers various recent developments that disprove Anthropogenic Global Warming and how it might impact the bus industry. Printed in the January, 2010 National Bus Trader magazine. The story behind Freightliner Custom Chassis Corporation and their current product line that has raised the quality of mid-size buses in recent years. Printed in the September, 2009 National Bus Trader magazine. Activities at the July, 2009 rally of the MCI Internaitonal Chapter of FMCA in Columbus, Ohio. Printed in the September, 2009 National Bus Trader magazine. bus operators in Virginia. Printed in the August, 2009 National Bus Trader magazine. A look at the new technology being used for tire retreading plus a station-by-station tour of the modern Brahler Tire Retreading plant in Jacksonville, Illinois. Printed in the August, 2009 National Bus Trader magazine. Creative Mobile Interiors, one of the most versatile conversion firms in the United States, celebrates its 10th Anniversary by moving into a new and modern conversion facility in Grove City, Ohio. Printed in the July, 2009 National Bus Trader magazine. The story behind why MCI filed Chapter 11, information on the pre-negotiated filing, and details on the procedure and MCI’s emergence from Chapter 11 seven months later. From the June, 2009 issue of National Bus Trader. The story behind Windstar Lines, a respected bus operator in Iowa that grew from a family travel business. Printed in the May, 2009 National Bus Trader Magazine. With the help of two experts, we take a hard look at compartmentalization and seat belts, their good points and bad points and their pros and cons. We also try to clear up some misinformation. From the March, 2009 issue of National Bus Trader. The Volvo D-13 engine was offered in Prevost coaches starting in 2008. This article provides opinions and reports from some of the first bus operators to use this engine. From the February, 2009 issue of National Bus Trader. This article covers the wide range of enhancements and improvements in MCI models for 2009. From the January, 2009 issue of National Bus Trader. A detailed review of the Beru Tire Monitoring System as offered by Prevost. Printed in the October, 2008 National Bus Trader magazine. A great look into the inspiring 75 year history of the company: from it’s beginnings in the 1930’s to it’s plans for the future. From the August, 2008 issue of National Bus Trader. Published on the 75th Anniversary of Motor Coach Industries, this tells the story of how Harry Zoltok took MCI from a local body and paint shop to the leading manufacturer of intercity coaches in America. Printed in the June, 2008 National Bus Trader magazine. An article detailing the both the history and the product line of the Blue Bird Corporation. From the May, 2008 issue of National Bus Trader. The famous antique bus was dedicated and donated to the Museum of Transportation in Hershey, Pennsylvania. From the May, 2008 issue of National Bus Trader. Association Motorcoach Expo in San Francisco in January of 2008. From the April, 2008 issue of National Bus Trader. Some history and current operations of Creative Mobile Interiors of Grove City, Ohio. From the April, 2008 issue of National Bus Trader. A look into the history of the successful bus company Krapf. This article appeared originally in the January, 2008 issue of National Bus Trader. Mike Manganello from Lightrider and Jan Van Eck form Flying Dutchman Coaches discuss the pros and cons of articulated low-floor intercity coaches from the standpoints of passenger needs as well as operations and practicality. This article appeared in the August, 2007 issue of National Bus Trader. Covers the first Busworld Turkey in Istanbul on February 8-10, 2007. This article also provides some information on bus manufacturing in Turkey. This article appeared in the May, 2007 issue of National Bus Trader. A tribute to Patricia Ziska who celebrated 30 years with MCI in December of 2006. This article appeared in the January, 2007 issue of National Bus Trader. MCI’s increased customer support and service in the Norteast states which includes a new parts facility in the New York City area and a new service facility in Atlantic City. This article appeared in the September, 2006 issue of National Bus Trader. This five-page article covers the improved and enhanced C2045E model as well as the M1235 model. This article appeared in the August, 2006 issue of National Bus Trader. A report on Bitimec and it’s SpeedyWash system, which provides the versatility of hand washing with the speed and quality of a washing system installed in a building. This article appeared in the November, 2005 issue of National Bus Trader. A report on the increasingly popular ZF AS Tronic transmission, information from bus owners who have experience running it, unexpected advantages, and retrofit information. It appeared in the October, 2005 issue of National Bus Trader. The J4500, the most popular seated motoroach model in the United States and Canada will soon become available as a conversion shell. This article appeared in the October, 2005 issue of National Bus Trader. Details behind the impressive hudrogen fuel cell project, using full size Van Hool buses, engineered by AC Transit in San Francisco’s East Bay area. It appeared in the September, 2005 issue of National Bus Trader. Another time, another era. The story behind how Continental Trailways sold their used buses in 1969. What models were being sold and what models were being replaced. It appeared in the September, 2005 issue of National Bus Trader. This article covers Creative Mobile Interiors of Grove City, Ohio in their sixth year of operation. Much of the article concentrates on extensive variety of services available. From the July, 2005 issue of National Bus Trader. This article provides information on Alcorn McBride and their new Digital Audio Machine which combines GPS technology with an automated on-board announcement system. It appeared in the June, 2005 issue of National Bus Trader. This six-page article covers ABC’s recent workshop for those involved with insurance, adjusting and estimating. It appeared in the May, 2005 issue of National Bus Trader. Originally printed in the February, 2005 issue of National Bus Trader, this technical and historical article covers the background and history of integral design buses starting in the 1930s, how two different types developed, how integral design spread to Europe, and some current information. This three-page article provided by Lancer Insurance talks about the causes and concerns of driver fatigue and appropriate action to reduce the problem. It appeared in the August, 2004 issue of National Bus Trader. This article covers the opening of the new Charlotte RV Service in Charlotte Harbor, Florida. In addition, it mentions Vehicle Clinic in Detroit which was also founded by Amos Slater. This article is printed from the July, 2004 issue of National Bus Trader. This article covers Fullington Auto Bus/Fullington Trailways of Pennaylvania. It appeared in the June, 2004 issue of National Bus Trader. Prevost has developed an impressive group of six service centers in the United States and Canada. While they provide warranty work, they also house a full service parts department as well as coach service and repairs. Printed in the February 2003 National Bus Trader magazine. The J4500 is continuing to become the MCI model of choice for commerical coach operators. Most of the major systems on the J4500 are electronic. Driving the AS Tronic is like driving a basic 10-speed transmission. From the January, 2003 issue of National Bus Trader. the September 2002 National Bus Trader magazine. The Rosa Parks Bus by Larry Plachno. The most sought after historical bus is the TDH3610 transit bus built by General Motors in 1948. From the September, 2002 issue of National Bus Trader. Three pages, from the July 2001 issue of National Bus Trader. Tells the story behind racing star Jimmy Adams and his 35-foot MCI F3500 which transport the Southern Comfort Racing Team and pulls the trailer with his Porsche GT3. Five pages from the May, 2001 issue of National Bus Trader. Covers the history of Anderson Coach & tour in Greenville, Pennsylvania which is celebrating 65 years of business in 2002. Seven pages, from the April, 2001 issue of National Bus Trader. Covers the history of the MCI models from “A” to “J” with years of production, basic similarities and differences, and the current MCI product line. Two pages, from the February, 2001 issue of National Bus Trader. Have you thought about starting your own bus company? The United Motorcoach Association provides this list of things to consider. Seven pages, from the February 2001 issue of National Bus Trader. Conceived in 1939, the Futurliners were built on the same line as the early Silversides buses and went on to support the GM Parade of Progress. This tells the story behind the Parade of Progress and its vehicles. Five pages, from the January 2001 National Bus Trader. Van Hool joins an exclusive group with their C2045 which is now in rugged scheduled service with three Greyhound affiliates. Four pages, from the December 2000 issue of National Bus Trader. A somewhat philosophical look at changes in the bus industry and how they affect our future. This article has been highly complimented by many people in the industry.